Years ago, my Aunt Bette gave me a granola recipe. It was very involved, with lots of ingredients. 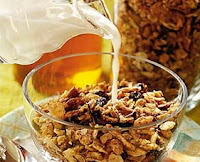 My love for granola runs deep and thus, the quest for an easier recipe began. I have tried, altered, discarded and invented countless versions for years until approximately ten years ago, I came upon a granola prototype that suited me in its simplicity. I reduced the amount of fat and sweetener by half and came up with several combinations to suit my family's tastes. This recipe is designed for just that purpose... change. I love nuts and seeds. My two precious girlies do not. We all adore toasted coconut. Get creative and make your family's fave! Melt butter and honey in microwave. Stir in vanilla. Place oats, cinnamon, coconut, raisins and nuts in large bowl. Stir together. Pour honey mixture over oat mixture and mix well. Spread out on two baking sheets, half of mixture on each. Bake @ 400 degrees for 10 min. (Check it around 5 minutes in. Stir if granola around the edges of pan looks brown. Continue baking, 5 more minutes.) Cool, then store in an airtight container. Place a small amount of plain or vanilla yogurt in an individual serving dish. 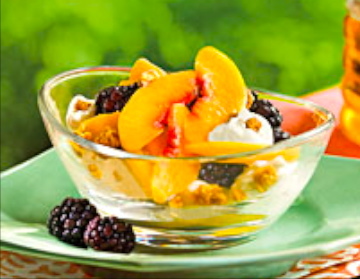 Add a layer of fresh fruit, then a layer of granola. Repeat steps, ending with granola, until dish is full. I cannot wait to make this! I also like to use a thawed package of frozen fruit (any kind) and granola to make a healthy breakfast cobbler. Thanks Food Maven!